The famous striker had a singular season, but after injury and a gut-wrenching World Cup for Egypt, the 26-year-old faces an uncertain future. Mohamed Salah's season, and however many seasons more, turned on a contested throw-in. Seconds into the 25th minute of the Champions League final between Liverpool and Real Madrid in Kiev, Marcelo and Georginio Wijnaldum fought for a ball in Real's half, a meter or two from Zinedine Zidane's no doubt twitching feet. There was dissent on both sides over the last touch, including from Salah, who outstretched both arms in appeal. The ball was finally awarded to Liverpool. Trent Alexander-Arnold raised it over his head. Four Liverpool players pushed deeper into Real territory. Six Real players kept watch. Salah, playing on the right, had advanced the farthest, which pushed him into the defensive orbit of Sergio Ramos, perhaps the most dangerous player in the world. The instant Alexander-Arnold released his throw, Salah burst on a line toward the center of the pitch. Ramos, a step behind, gave his usual determined chase. The ball dropped into open space, not far ahead of Salah. By then, Ramos had closed the gap between him and his mark, breathing down Salah's exposed back. Salah, Ramos and the ball came together. The clock read 24:40. Millions of eyes around the world trained on that tiny constellation of timing and fate, the paths of two men about to meet and be made divergent at the same time. After an incomplete touch with his feet, Salah tried to settle the ball with his head. His arms caught in a tangle with Ramos, who stretched his left leg across Salah. Ramos found a sliver of the ball but more of Salah, and the two began tumbling to the ground. In that frozen moment, everything was still possible. The game was scoreless. Nobody was hurt. After one of the great goal-scoring campaigns in football history, Salah was still the object of wildest imaginations, a possible winner of the Ballon d'Or. The weight he carried was that of the most optimistic projections. There was only hope. Liverpool should still sell him. His value might be less than it was 24 minutes and 40 seconds into the Champions League final, but it will only continue to drop. Liverpool should sell Mohamed Salah as soon as they can. LIFE CAN'T BE PAUSED. Now we know how so much more of Salah's story unfolds. He will sit up stunned on the grass, Ramos climbing to his feet behind him, and realize something is wrong. Play will continue. Salah will fall onto his back, holding his left shoulder. The whistle will finally go. Ramos will stand over Salah, encouraging him to get up. Salah will not. Eventually, he will climb to his feet and try to play on. In the 28th minute, Salah will give chase to the play. He will seem fit. There will be the subtlest betrayal that he is not: When he runs, his left arm will not move as freely as his right. The ball will go out for a Liverpool corner, and Salah will bend over, on the verge of a heartbreaking decision. When the corner is taken, he will stand outside of the box, withdrawn from the play. After the whistle is blown, the ball dead, he will return to the grass, a little more than three minutes after Ramos had first brought him there. The difference this time is that Salah will be crying. He will by carried from the game by his flood of tears. Liverpool will lose 3-1. Days of speculation will follow: whether Salah will be fit for the World Cup, whether he will continue to lift Egypt to historic heights. There will be light. His injury will be deemed not as serious as first feared. But Salah will mysteriously sit for his country's first World Cup match since 1990, a loss to Uruguay on his 26th birthday. He will start the next game against Russia but be mostly lifeless in it, potting a penalty after the hosts have built an insurmountable lead. After speculation that he is quitting the national team, Salah will start in a stunning 2-1 loss against Saudi Arabia, scoring a chip that his most blindly faithful fans will cast as face-saving, however thin, however hollow. What will happen next? Nobody knows, of course, just as nobody knew that a young Egyptian would arrive in Liverpool with relatively modest fanfare and score more goals with his left foot in a season than any other player in Premier League history. But a closer look at Salah's season, including its sad end, suggests that the best for him is no longer yet to come. His best has happened. IF THERE WAS a single game that encapsulated Mohamed Salah's season at Liverpool, it was the second leg of their Champions League quarterfinal against Manchester City. It was a night when he did almost nothing, except that he did everything. Liverpool had won the opening leg in convincing fashion: 3-0 at an ecstatic Anfield, including Salah's opener in the 12th minute. Liverpool's advance was all but assured. A single goal in the second leg should seal it. The only complication was that the goal would have to come against one of the greatest football teams ever assembled at the heaving, pride-stung Etihad. It took two minutes for City to score. Manchester, city of football miracles, was about to bear witness to another. There were 88 minutes to go. Salah had started his night in his usual way: He stood alone on the grass in silent prayer. For what seemed an interminable amount of time, that was the closest he came to anything like action. He didn't touch the ball until the seventh minute. He seemed helpless to prevent City's rising in the back, always two steps out of position. If he did more than walk, he jogged, looking like a man trying his half-best to catch a bus. His manager, Jurgen Klopp, took notice. In the 26th minute, he directed Salah to switch from the right to the left, trading places with Sadio Mane. A minute more, and he pushed Salah to the middle, moving Roberto Firmino to the left. "Mo needed a little bit to come into the game," Klopp said after. Mo did not come into the game, not even a little bit. He remained in the role of pure striker to open the second half, high and alone, but Mane made the greater attacking efforts. In the 56th minute, Salah fed him a short ball, which Mane carried deep into the City box. Salah trailed behind him, watching his more energetic teammate break through. Mane fell when Ederson dived at his feet. The ball spilled into open space. Salah pounced. He took a single touch, pushing the ball farther to the outside of the goal, and then lifted a soft, looping shot into the back of the open net, perhaps the most critical in his season-long collection of perfect finishes. He ran toward the Liverpool supporters in their raging corner of the ground, his hands in the air beside him. He looked as though he might have returned to his prayers. Instead, he was once again the answerer of them. Asked to describe how that moment felt on the pitch, Alex Oxlade-Chamberlain used a single word: "relief." Liverpool would win the match, 2-1, and the quarterfinal with surprising ease. Now they would face Roma, Salah's previous side, in a fairy-tale semi. The football story of the year seemed destined to have its happy ending. It didn't matter that despite Klopp's tactical assistance, Salah had managed only 31 touches in the game, the fewest of any starter. (For comparison's sake, Mane had 64. Firmino, who scored Liverpool's second goal, had 52.) Salah had just 14 touches in the attacking third. He completed 67 percent of his 21 passes. He made zero tackles. He had a single shot. But that single shot had gone in. Football's master opportunist had scored again, and nothing else he did or didn't do mattered. Salah was the man who could not miss. LIVERPOOL ACQUIRED SALAH from Roma last June in what is now routinely portrayed as a robbery. He was signed for an initial transfer fee of £36.9 million. It does, in hindsight, seem like an incredible stroke of good fortune. Hindsight has its own way of overlooking inconvenient facts. Salah had been a long-term target for Liverpool, well before Klopp's arrival. The Reds had wanted Salah when Jose Mourinho's Chelsea signed him from FC Basel in early 2014, but Liverpool had deemed his then-price, an initial £12 million, too steep. Mourinho soon cooled on his new signing. In Chelsea's second-to-last game of the 2013-14 season against Norwich City, Salah was reportedly scolded by his frustrated manager at the half, told to come back the next season if he was "ready to be a footballer." It was a question of heart. Salah appeared only three more times for Chelsea before he was loaned to Fiorentina a little more than a year after his arrival at Stamford Bridge. Salah left London a failure. He eventually moved to Roma, where he found his scoring touch, pocketing 33 goals in two seasons. But he paled in productivity next to Edin Dzeko, who was coming off a 36-goal campaign, and Roma were being watched by UEFA for potential financial fair play violations. Salah had only a season left on his contract, and he had told the club that he wanted to leave for the Premier League, to prove himself after his humiliation at Chelsea. "It was in my mind to come and be successful in England," Salah said. Considering that Salah had to be sold, Roma did well to get the price that they did. In fact, when Liverpool owner John Henry had lunch the next day with fellow Bostonian James Pallotta, Roma's owner, Pallotta felt guilty enough to foot the bill. "Did we overpay?" Henry asked Pallotta. "I think we overpaid." Liverpool's bid was a club record. It was also the only offer of its kind that Roma received. "When you look at it now, you could say, 'Oh, unbelievable bargain,'" Pallotta told ESPN ahead of the Champions League semifinal. "I can't tell you that anybody else was calling at that time for Salah at anywhere near that kind of price. There are a lot of teams that have missed out." Salah was not in hiding. He was not playing in the dusty streets of his village in Egypt. He was playing for Chelsea, and for Fiorentina, and for Roma, under the constant watch of football's vast network of visionaries and intellects. Everybody in the game took a look at him, and only one side saw a player worth £36.9 million. That's probably not because everybody in football went dumb. Now, after a single, incredible 44-goal season, and after Neymar's explosive signing with Paris Saint-Germain warped the transfer market, and after Liverpool themselves sold Philippe Coutinho to Barcelona for nine figures, there have been suggestions that Salah might be worth more than £150 million, or nearly four times his purchase price from only a year ago. Virtually any other asset, in virtually any other business, that had appreciated that much in such a short period of time would be considered almost too hot to touch. But football is not any other business. Sometimes everybody in football goes dumb. THE WORLD CUP can make names for its players. The 2014 tournament alone minted several new stars. Keylor Navas performed well for Costa Rica and ended up a champion at Real Madrid. James Rodriguez dazzled for Colombia, and again it was Real who doubled Monaco's price. Salah's stature was only diminished this summer in Russia. He suffered from the wrong kind of exposure. To be fair, he was the principal reason Egypt qualified for their first World Cup in 28 years. He secured their entry with a cool, late penalty against Congo in qualifying, cementing his place as a national hero and sending thousands of tearful worshippers into Cairo's heaving streets. The Pharaohs were further rewarded with one of the easiest group draws in World Cup history. After their opening match against Uruguay, they would face Russia, the worst team at Euro 2016, and Saudi Arabia, the worst team in the tournament. Egypt still managed to be the first team eliminated, and after only two matches before losing again to the more determined Saudis. The response at home varied between disgust and resignation: It was not to be. It was never to be. Watching Salah play for Egypt rather than Liverpool is like watching a river trying to find its way around a new dam. Liverpool's attack is difficult to counter because it's so balanced and broad. Together, Klopp's front three scored more goals than any other front three in Champions League history: 30, two better than Real Madrid's Cristiano Ronaldo, Karim Benzema and Gareth Bale in 2013-14. Salah scored 10 of them. Firmino scored 10. Mane, who netted Liverpool's lone goal in the final, scored 10. Salah's season-long goal-scoring numbers separated him from his teammates -- nobody was talking about paying nine figures for Firmino or Mane -- but they are three tributaries of a whole. (There is a good case to be made that Firmino, not Salah, is the real force among them.) With Egypt, Salah is a solitary concern. Take away Salah, and the river is stopped at its source. Back in March, Egypt faced Portugal in a friendly in Zurich. More than 20,000 fans poured into Letzigrund Stadium to see Salah face Ronaldo, the two highest goal scorers in Europe at the time. Despite its low stakes, the match was billed as a kind of referendum, a chance to see whether the then-25-year-old Salah, coming off his four-goal performance against Watford, was ready to eclipse the 33-year-old Ronaldo, coming off his own four-goal performance against Girona. Ronaldo, resentful of the premature comparison, came out possessed. Before the opening whistle, he stood behind Salah with his hands on his hips and glared a hole into his back. Once play began, he held the ball more, took more shots and nearly scored on a free kick. Early in the second half, he made a blind pass that left the nearby Egyptians, including Salah, looking as though they had seen magic. But in the 56th minute, Salah somehow opened the scoring. Inexplicably abandoned by the Portuguese defense at the top of the box, he was fed the ball and lined up a finish in his most classic form -- not a rocket but an arrow, aimed with precision low and to his left. Ronaldo looked disgusted. The way he had matched Salah's dismantling of Watford against poor Girona, he decided to reassert himself against Egypt. A spent Salah watched from the bench when Ronaldo scored twice in injury time to steal the 2-1 victory, heading home both goals off crosses, one from the left and one from the right, one very late and one even later. The celebration of the second was delayed for a moment by a video review, but the officials soon confirmed what everybody else, including Salah, already knew: Ronaldo had found a way to win again. THAT DECISIVE NIGHT in Zurich was a secondary version of football's most foolish debate. Whenever Salah has been compared to the world's best, the consensus choice is Lionel Messi. Physically they are similar, short and left-footed, and spiritually they are, too: Salah and Messi are both less obvious about their ruthlessness than Ronaldo. Salah had looked embarrassed by his fourth goal against Watford. Ronaldo did not seem embarrassed by any of his against Girona. Even before Ronaldo scored Portugal's first four goals at this World Cup, seeing his country easily through to the knockout round, either comparison was as idiotic as the other. Salah's own teammates have admitted as much, if more gently. "This season, he can definitely compete with them," Georginio Wijnaldum recently told ESPN. "But if you want to speak about the level of Messi and Ronaldo, a player has to do it for many more years." Football has a long history of breakout seasons. Football also has a long history of freakish ones. Only time can spot the difference between them. Michu scored 22 in his first season at Swansea; Kevin Phillips scored 30 in his debut campaign at Sunderland; a 25-year-old Egyptian named Amr Zaki scored 10 in a hurry for Wigan in 2008 and was soon touted as the "world's best striker." Amr Zaki's name is not listed among the best of anything anymore. Asked to explain Salah's sudden emergence, Klopp shrugged: "He grew up." Klopp has also conceded that he expects nothing from Salah but goals: If he's two steps behind in defending against the counter, that means he's two steps ahead for Liverpool's inevitable return. Salah has been given exactly the right manager, playing exactly the right brand of football, with exactly the right players around him, to score goals. Those same circumstances could be recreated next season, but last year Salah already showed signs of fading. He seemed certain to break Ian Rush's club record for goals in a single season but fell short in the end. Liverpool's second leg in their semifinal against Roma, which saw the Reds nearly lose their 5-2 first-leg advantage, was one of his worst games of the season. He managed 30 touches, again the fewest of any starter. (Firmino had 58 and Mane 51.) He attempted only 16 passes and didn't score a performance-defining goal. His vanishing act left the more permanent impression. If Salah was tired, Firmino and Mane are both older and expected to do more. At Roma, Klopp had Mane retreating all the way back and relied on Firmino to create the chances, with the Brazilian making more than twice as many pass attempts as Salah. The more troublesome explanation for Salah's late-season diminishment, and the more likely one, is that he is not the toughest safe to crack. THE GAME EVOLVES with its players. The world's best forwards play against the world's best defenders. When trying to divine Salah's future place among the greatest in the game, the number of goals he's scored is only part of the equation. How he scores them also counts. Ronaldo is far more balanced in his attack. Of his 44 goals in all competitions last season, he scored 27 with his right foot, 10 with his left and seven with his head. Salah's productivity stems overwhelmingly from his left foot: 36 of his 44 goals in all competitions. He scored only twice in the air. Messi is even more imbalanced -- scoring all but three of his 45 goals last season with his left foot -- but his range and power make him a harder player to stop. We might imagine Messi charging his way toward goal on one of his trademark runs, but in reality his average strike came from more than 15 yards away, and he scored 11 times from outside the box. Salah's softer touch requires him to be closer to goal: He scored, on average, from 12 yards out, and he scored only six times from more than 18. His incredible season is a testament to the gift of being able to do one thing extraordinarily well: Put the ball on Salah's left foot somewhere in the vicinity of the penalty spot -- better yet, just to the right of it when facing goal -- and he's more than likely to score. "Where I'm surprised is how great he's finishing," James Pallotta said. "Do they have bigger nets in the Premier League? It's just been amazing watching him. And every time he scores I'm like ..."
Pallotta tipped his head back and sighed: "Oh my God." But there is an obvious disadvantage to being so single-faceted, however polished that facet might be. Take away Salah's left foot, or push him more than 12 yards from goal, and he won't be able to do one thing extraordinarily well anymore. He won't be compared to Messi, and he won't be compared to Ronaldo. He'll be measured against his formerly anointed self, and by how ordinary he suddenly looks at doing everything else. IN THE LAST minute of Egypt's World Cup loss to the Russians, Salah didn't touch the ball. He didn't come near it. He'd had a mostly miserable game. The Russians had taken away his left foot and pushed him more than 12 yards from goal. Salah had only 19 touches in the first half, the fewest of any Egyptian outfield player. He had made 12 passes, taken a single shot and lost possession four times. The Russians had also scored three before Salah managed his one. For once his goal wouldn't prove the difference. It wouldn't mask the holes in his contribution, his inaction, his softness. 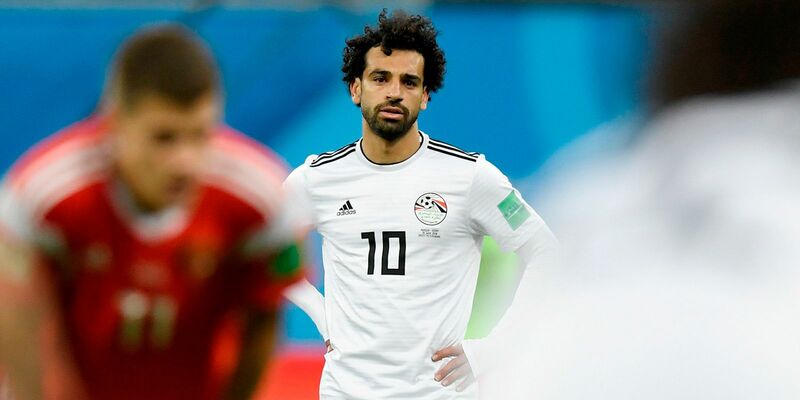 It had taken Egypt 28 years to reach the World Cup and six days to be all but eliminated from it. Great players, like Ronaldo that cold night in Zurich, write their own endings. Salah accepted the end he was given. Salah finished the game with his head down. He was looking at his boots when the whistle blew. He made quickly for the exit, brushing past the commiserating hands of his coaches and teammates. If there were more tears to come from his eyes, they would be private. Jose Mourinho had it right: Football has always been a question of heart. This time, Mohamed Salah's heart didn't seem broken. His heart, like him, like Egypt, was gone.